You’ve got mail. Again. When you’re in constant battle with an overflowing inbox, receiving mail isn’t always fun. In fact, it’s downright distracting. So why bother? In a world that’s brimming with innovative communication channels, it seems downright mad that businesses would keep on returning to email – the ultimate productivity zapper. But while some old habits may die hard, we’d like to bring back a pretty basic one – conversations. With so much of our communication played out via email and messaging tools, sometimes we all need to take a step back. That’s where videoconferencing comes in. It’s quick, it’s innovative, and it doesn’t clutter your inbox. Bliss. Here’s how videoconferencing can help you slim down your inbox and break that email habit for good. Most of us spend almost 30 percent of our work week reading, writing, and responding to emails. That’s a lot of time, a lot of frustration, and a lot of annoying email chains. So why not give videoconferencing a shot instead? Looking to get more productive meetings? Download our checklist to learn how. 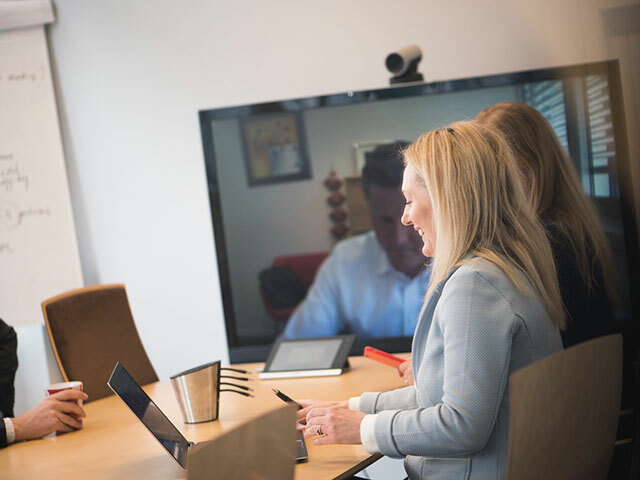 Rather than the never-ending back and forth of email, video meetings make sure you – and your whole team – are heard the first time round. And for those things that can’t be explained in words, there are pictures. The right video solution will allow you to seamlessly combine visual cues and graphics into your presentation, making it easier to improve your meeting processes on a global scale. We’ve all been there. You’ve sent a long list of questions to a client or colleague, only to get none of the answers you’ve been looking for. That’s because written communication is pretty inept at dealing with the subtleties of human interaction (and why no reporter worth their salt would be caught dead pushing for an email interview). The simple fact is that if you have questions, you need answers. And the only way to get them quickly and efficiently is by speaking up. Slow decision-making is the bane of modern business. Not only is sluggish progress the ultimate momentum-zapper, but it can have a seriously damaging effect on your bottom line. So when things start slowing down, speed up your communications with videoconferencing. Speaking face-to-face with key players enables rapid decision-making, allowing you to share, explore, and zoom in on your best ideas. When it comes to calling the shots, video is the only way to go. Why are efficient communication tools important in business? Click here to read our blog post. Just because you’re not in the same office, doesn’t mean you can’t work with colleagues in real-time. Sure, some of the standard video technology might be too creaky for corporate collaboration, but there are good, modern options that not only lets you share concepts, graphs and statistics during your meeting, but lets you live edit them too. Plus, regardless of how many participants there are on the call, you can ensure everyone sees the relevant content at exactly the right time. All the while making sure everyone’s on the same page. Literally. Everybody hates getting CC’d into a never-ending email thread. So why are we all guilty of it? Next time, do your team a favor and stick to videoconferencing. Not only does it mean you can avoid navigating a hellish email chain, but it also lets you ask the right questions to the right person. No pain, no fuss, no persistently pinging cell phone. Perfect.